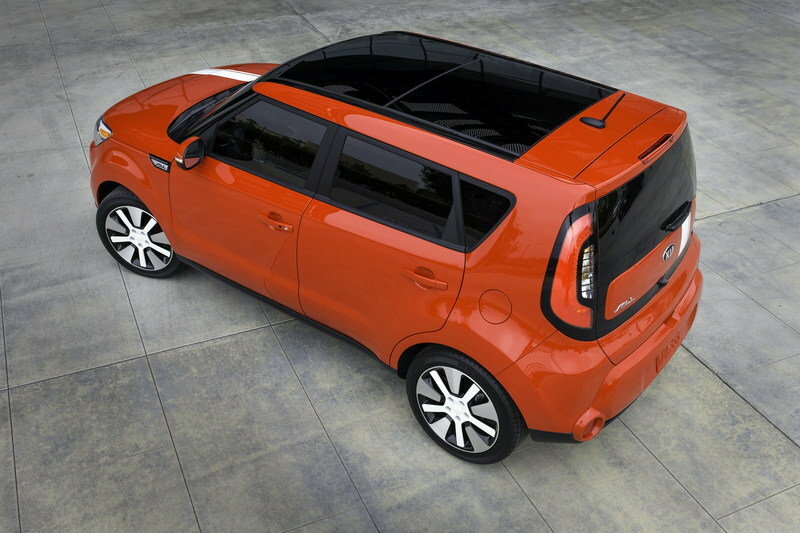 The Kia Soul was introduced in 2008 as a concept, and later as a production model for the 2009 model year. It didn’t come to the states until 2010, where the first generation lasted through the 2012 model year. 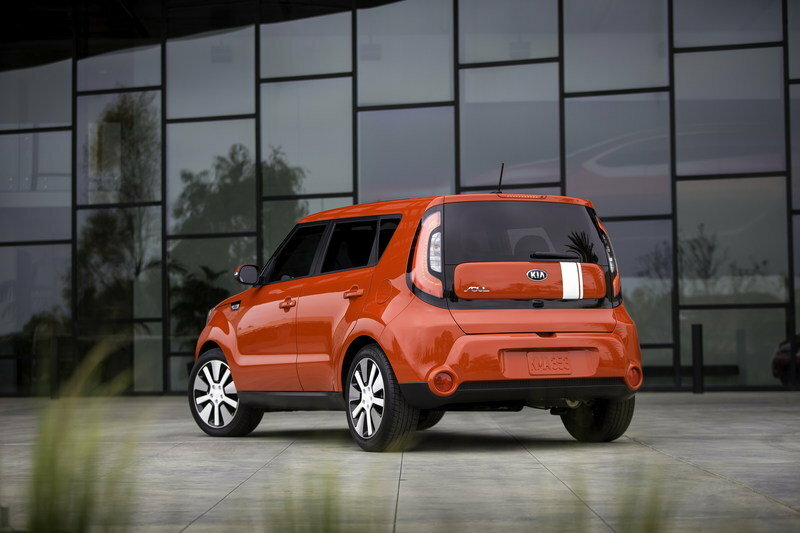 For 2014, Kia brought us the second-generation Soul that included design elements from the Tack’ster Concept from 2012. On the outside, the Soul received new exterior light units, a slightly revised front and rear fascia, and new side view mirrors. Inside, the interior was fitted with softer materials on the dash, center console, and door panels to help improve its “premium” appearance. Other interior features included a round shifter knob, push-button start, and revised steering wheel controls. Under the hood, consumers had the choice of a 130-horsepower 1.6-liter or a 164-horsepower 2.0-liter engine. A six-speed manual came as standard equipment, but a six-speed automatic was available at a premium. To round out the new Soul, it had an all-new chassis that was stiffer than before, heavily revised suspension, and a one-piece steering system. In all reality, the Soul really didn’t change all that much, and to the untrained eye, the subtle changes that came with the second generation may not even be noticeable. Then again, Kia put a lot of work into the chassis and suspension, so ride quality and overall structural rigidity were increased significantly. Unfortunately, the second-generation model didn’t come with the cool hipster hamsters either, but that didn’t make the boxy little SUV any less fun to drive. 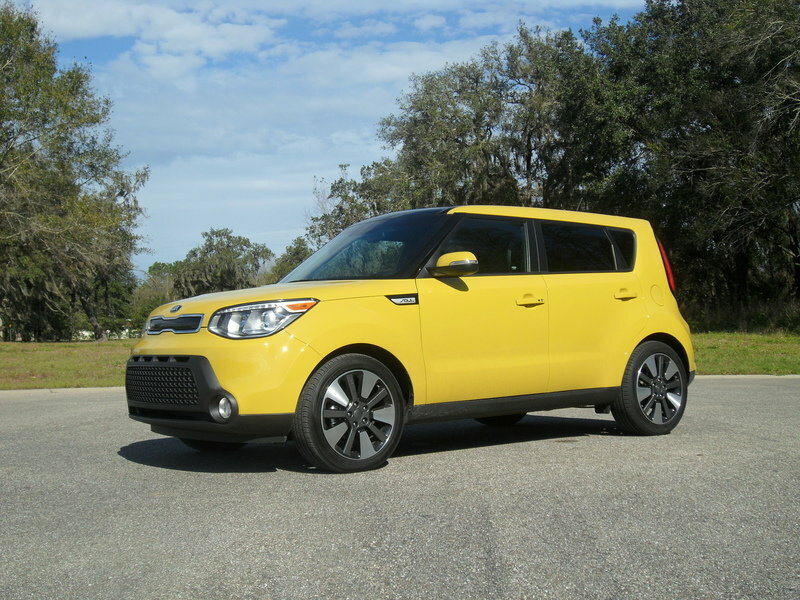 With that said, check out our full and detailed review below to learn more about the second-generation Kia Soul. Despite Kia's attempts to soften the Soul with rounded shoulders and hips, it is still really funny looking and very top heavy. 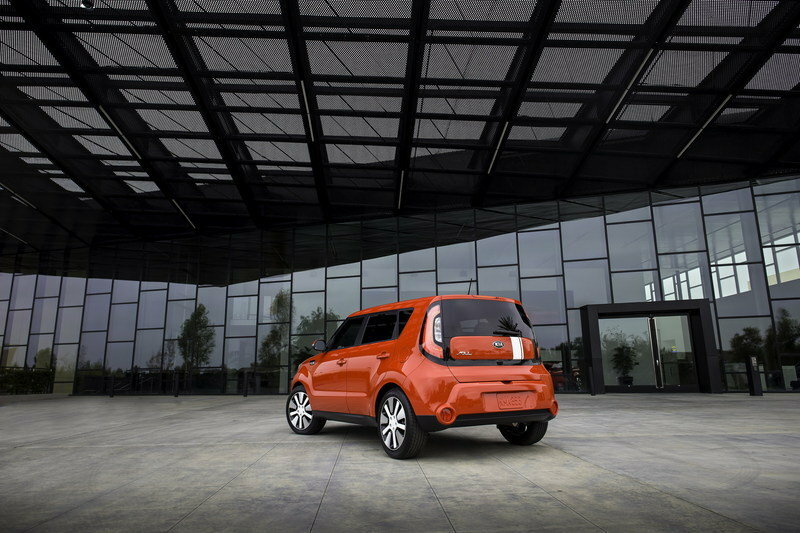 The Soul is already offered an unmistakable design language, but for the new generation, it received design elements we saw on the Track’ster Concept that Kia unveiled in 2012. The new Soul has grown in size and received a more aggressive appearance. Up front, it gets larger trapezoidal lower air intake, an updated grille that is now almost identical to the concept, new exterior mirrors, squared shoulders and distinctive fender flares. 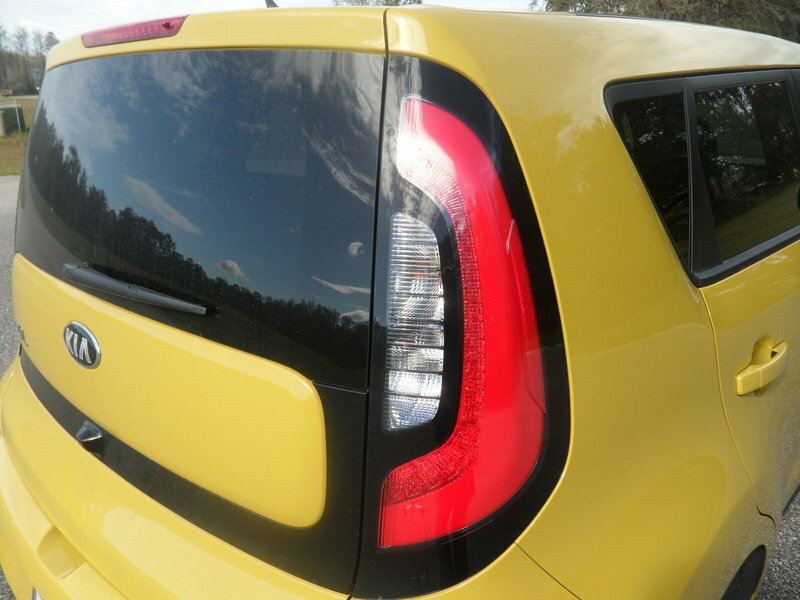 For the rear, Kia installed high-mounted taillights, tall ride height and rear LED "halo" lights similar to those seen in recently unveiled Kia models, like the Sorento and Forte. Customers will also have the possibility to choose between seven new exterior colors, two of them already unveiled in the Big Apple: Solar Yellow and Inferno Red. 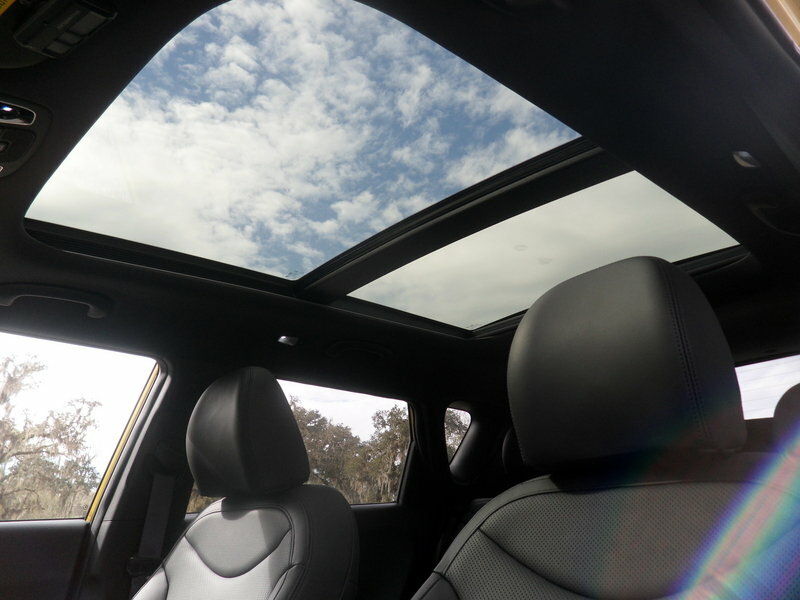 For the interior, Kia focused on offering a more premium appearance. For this, soft-touch materials have been used for the instrument panel, center console and door panels. The car’s seats received improved lateral and thigh support, while the center console and dash now feature a high-gloss piano-black trim. From the Track’ster concept, the new Soul received a round gear shift knob and push-button start, while the steering wheel controls offer easier use of the audio and navigation systems. 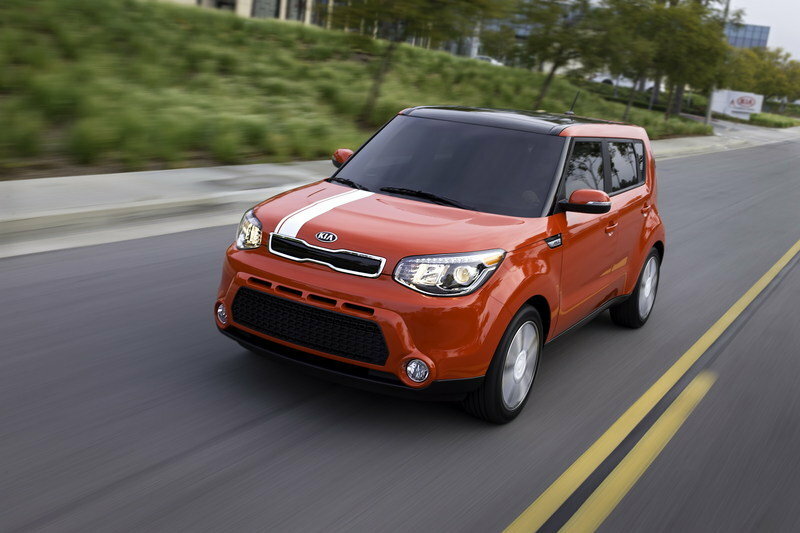 For the 2014 model year, the Soul will be offered with a choice of two engines. Base models will be come with a 1.6-liter all-aluminum DOHC four-cylinder engine that delivers a total of 130 horsepower and 118 pound-feet of torque. Top versions will get a 2.0-liter NU engine with an output of 164 horsepower at 6,200 rpm and a peak torque 151 pound-feet of torque at a 4,000 rpm. Both engines will be come standard with a six-speed manual transmission or you can opt for a six-speed automatic. 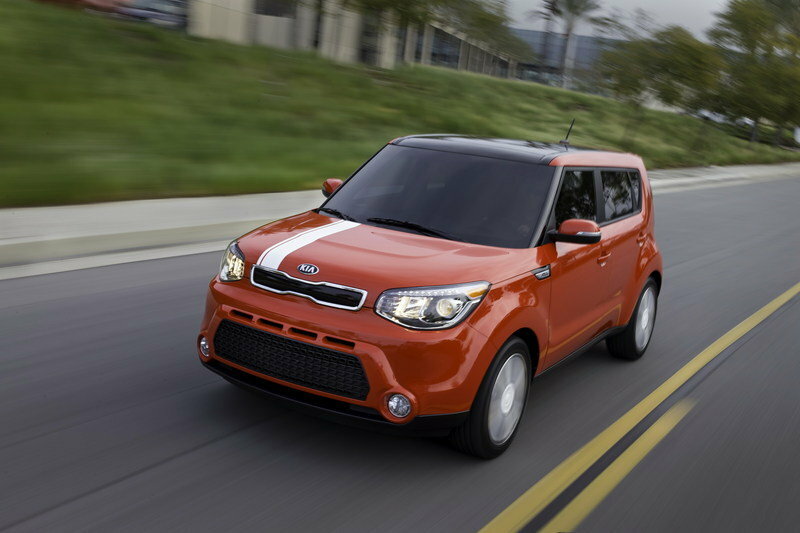 The 2014 Kia Soul is built on an all-new chassis that is now 29 percent stiffer than before. It gets a redesigned cowl, upper and lower B-pillars, cross members and C-pillars. 66 percent of the chassis is now made in either ultra-high-strength steel (35 percent) or high-strength steel (31 percent). There front and rear suspension has also been heavily revised with four bushings used for the front subframe. Additionally, the stabilizer bar has been moved rearward on the McPherson strut front suspension and the steering box has been moved forward. The steering system is now made in one piece, and not in two pieces as the current model. As an option, Kia is offering a new Flex Steer system with three distinct steering settings: Comfort, Normal and Sport. I got my first crack at a Kia Soul here recently, and I must say it was a lot of what I expected and a bit of what I really didn’t expect. First, let’s talk about what I did expect: it’s ugly. Despite Kia’s attempts to soften the Soul with rounded shoulders and hips, it is still really funny looking and very top heavy. Now onto some of the surprises I ran into when I had my week-long date with the Soul. 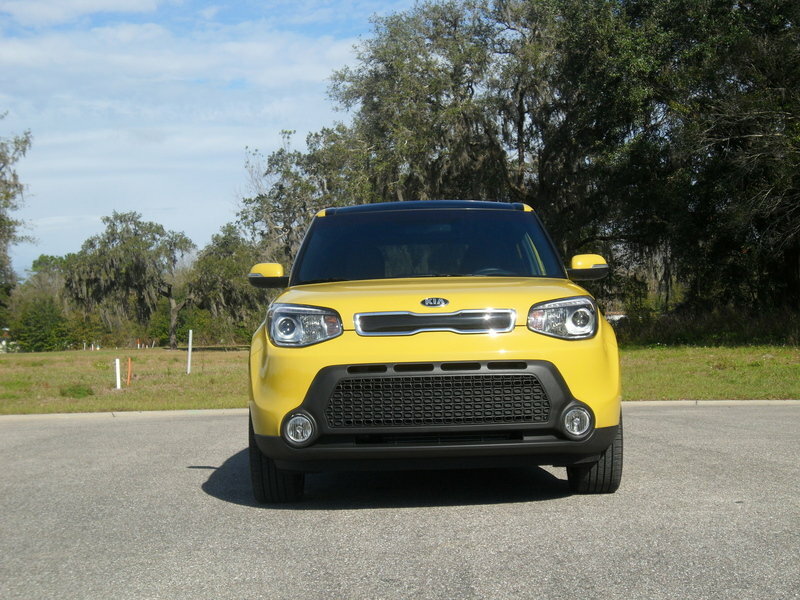 Allow me to preface this by saying that Kia gave me the top-of-the-like Soul! (the "!" is the trim level, not punctuation). Well, looking at the outside you would never expect what awaits you inside: a very luxurious interior. That’s right, I said a Kia Soul’s interior is "luxurious," so sue me. Soft leather seats fit my body nicely, the glow rings around the speakers are far less tacky in person, the audio system is precise and rich, the navigation screen is large and easy to read, the NVH levels are really low (unless you are at full throttle), the panoramic sunroof it fantastic and the UVO system is as good as it’s ever been. One downside, however, is the fact that there’s no CD player. I guess much like the shock of the first car not to have a cassette player, this will soon be the norm. 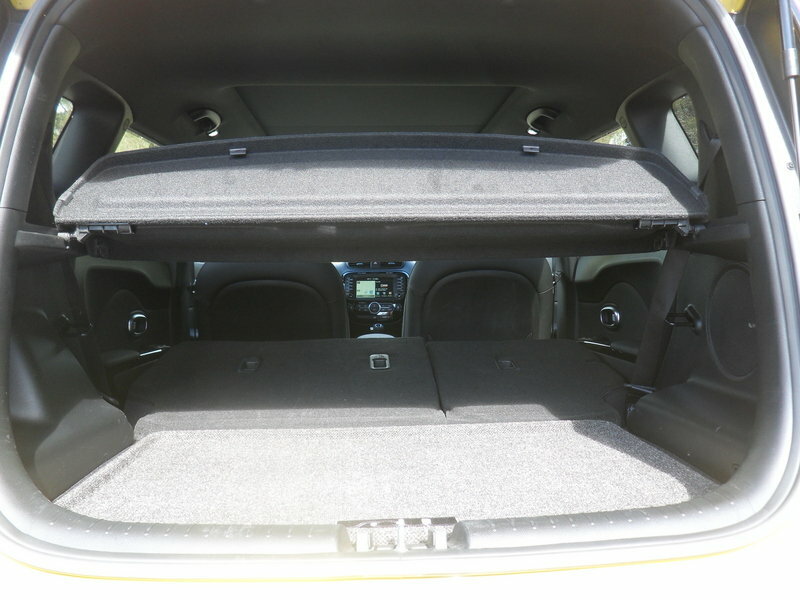 Cargo room was another sweet spot in the Soul!, as the high roofline and folding seats made sliding a in-the-box IKEA pantry in nice and easy. There is the aggravation of that silly cargo cover that is utterly useless in this model, but it comes off easily once you figure it out. Additionally, the drivetrain is rather competent. No, it is not fast by any means, but it is plenty to get the Soul! up and moving with traffic pretty easily. It handled bumps and jars pretty nicely, and rarely tossed me around the cabin. 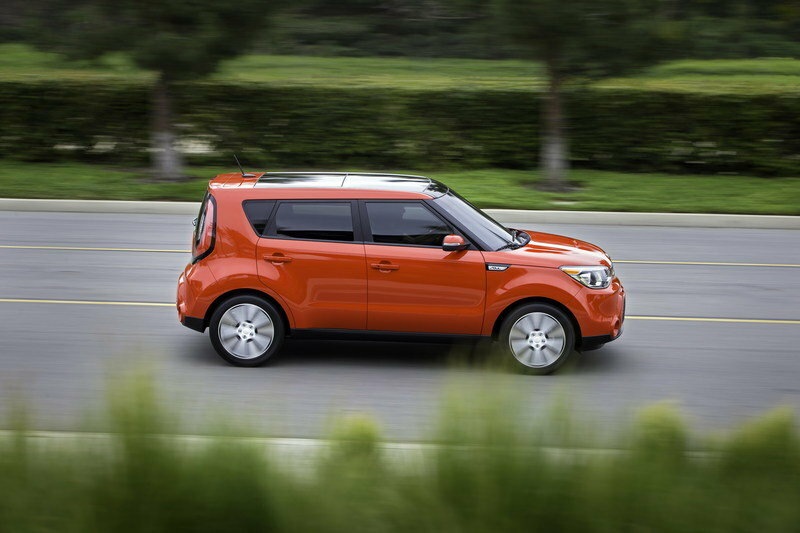 The new Kia Soul will be put on sale in the third quarter of this year. Prices will be announced at a later date. 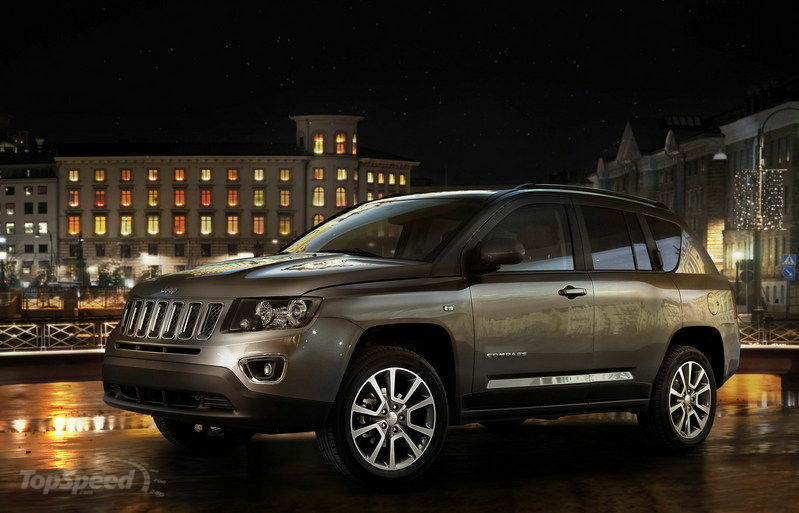 For the 2014 model year, the Jeep Compass has been updated with a series of changes to both the exterior and the interior, plus new North and Sport trims. Customers will have to choose between two engines: a 2.0-liter gasoline engine delivering 156 horsepower and a 2.2-liter turbo-diesel engine with an output of 136 horsepower. 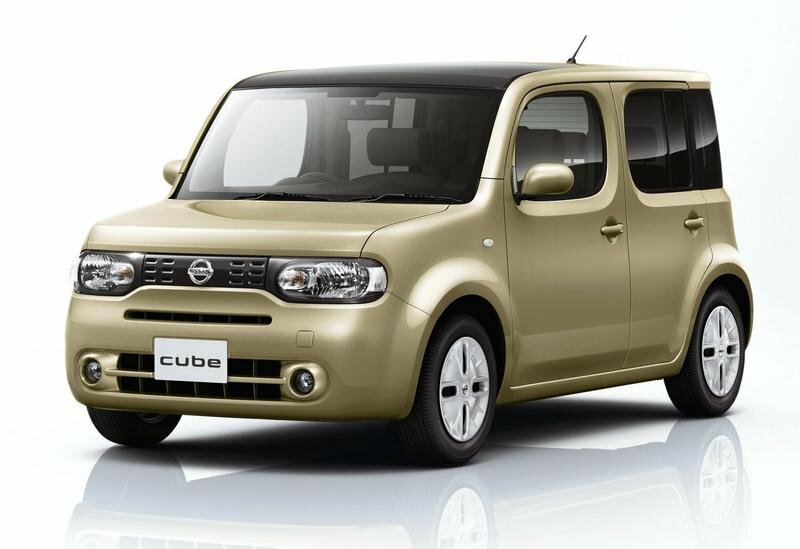 In the U.S. market, the Cube is comes with a 1.8-liter four-cylinder engine that delivers a total of 122 horsepower, making it the least powerful from all three models. Also, the Cube has the disadvantage of featuring a quite unique — borderline hideous — exterior, so it will definitely be our last choice. The Big Apple, perhaps America’s most iconic metropolis, is playing host to the global unveiling of Kia Motors’ most iconic people mover, the all-new 2014 Soul urban utility vehicle, today at the 113th New York International Auto Show. The signature Soul design is instantly recognizable yet thoroughly fresh, with more than a passing nod to the hot Track’ster concept that was unveiled last year. Riding on a new chassis that is stiffer, longer and wider, the all-new Soul has grown up without losing its edge, allowing for more passenger and cargo room while reducing NVH levels. 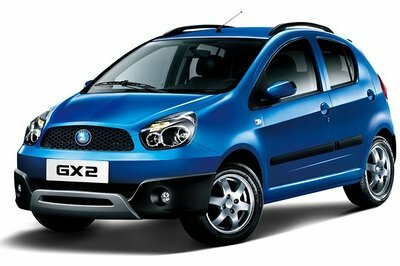 Increased torque and significant suspension upgrades make the 2014 Soul a nimble and agile companion in congested urban environments. 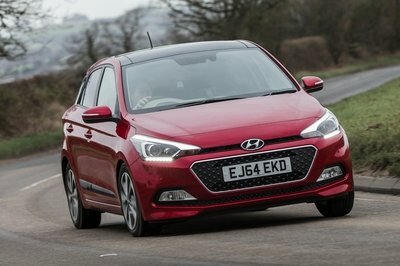 Honoring Soul owners’ fierce individualism, three unique trim levels will be available when U.S. sales are expected to begin in the third quarter of this year: Base, Plus and Exclaim. Pricing will be announced closer to the Soul’s launch date. Keeping what made the current Soul special while addressing areas for improvement was no easy task. As the design team at Kia’s California studio began putting virtual pen to virtual paper, engineers in the U.S. and Korea focused on making Soul a joy to drive. Starting with a solid foundation was a key factor, and the new body enjoys a 28.7 percent increase in torsional rigidity over the current Soul. With the hard points set, the all-new Soul was boiled down to three focus areas: Maintaining the iconic design while adding modern cues; providing premium features and content; and improving driving dynamics that would make the 2014 Soul more desirable than ever. 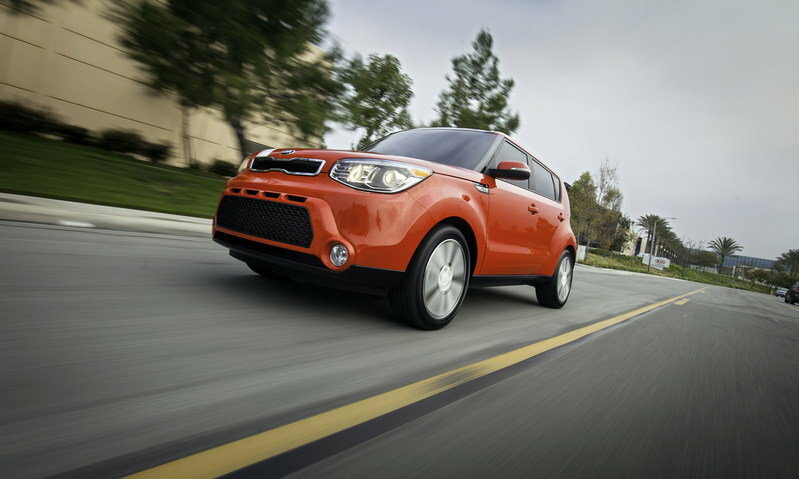 Well-known for the close link between its concept vehicles and production models, Kia Motors took no chances with the 2014 Soul. 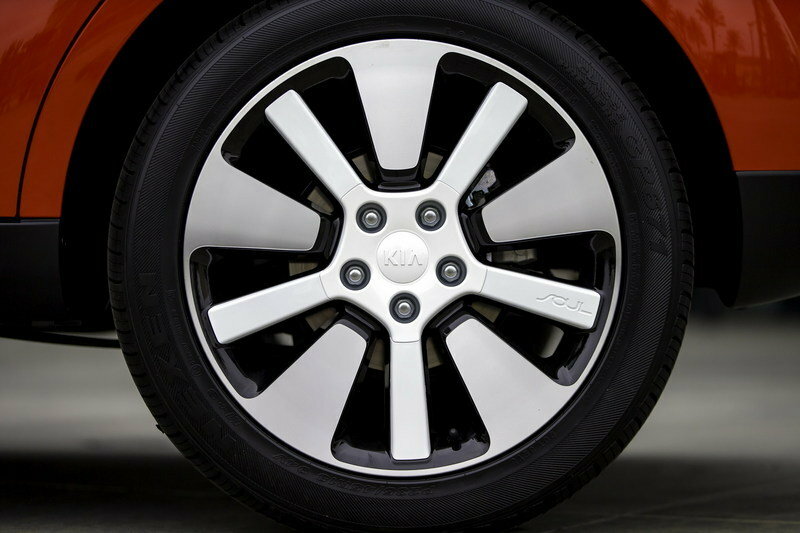 When the wild Track’ster concept made its debut in 2012, Soul enthusiasts and pundits alike urged Kia to turn fantasy into reality. With 18 months from design freeze to production, the stage was set for the all-new Soul and many of the concept’s dramatic design cues can be found in the production vehicle. 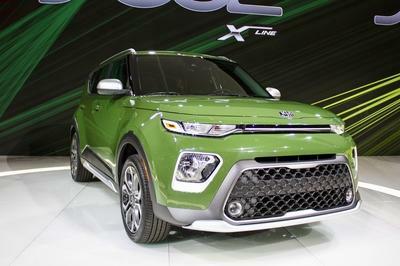 Tom Kearns, chief designer at the California studio likened the Track’ster to a bulldog and that theme is expressed from almost any angle of the all-new Soul. 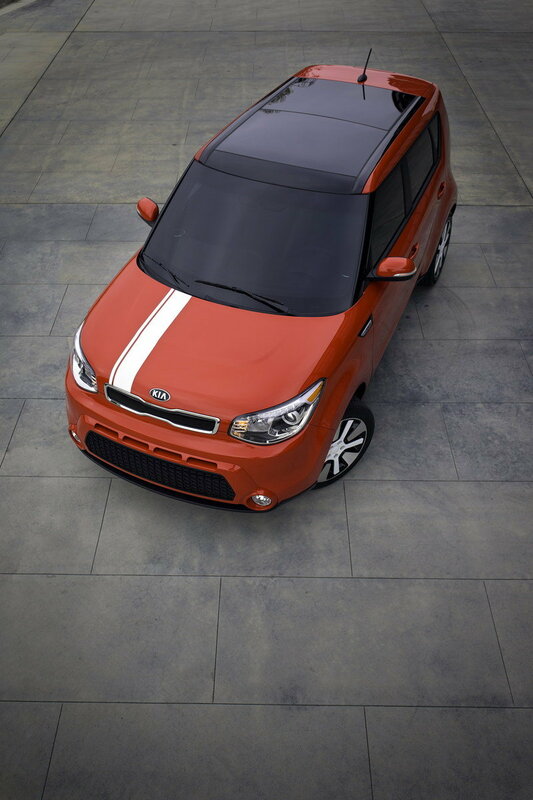 The upright stance, squared shoulders and distinctive fender flares are instantly recognizable as Soul. 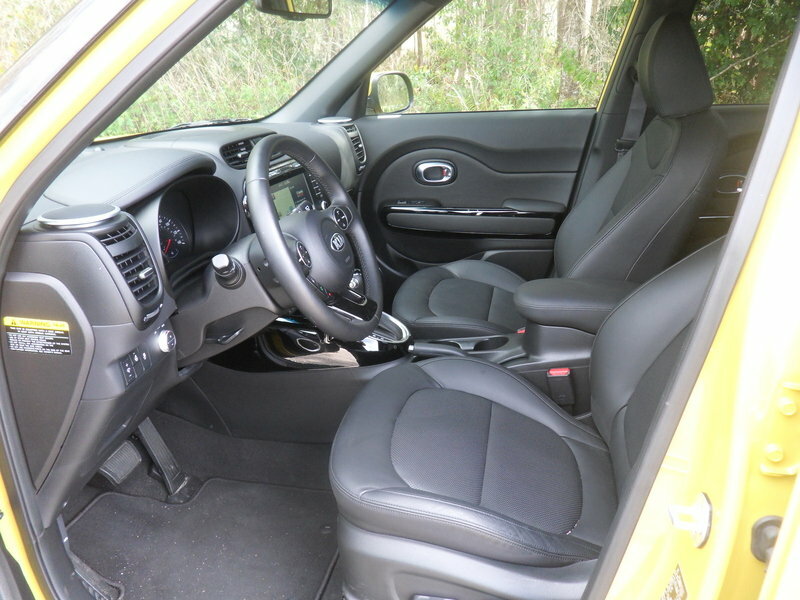 Combining a longer 101.2-inch wheelbase (up 0.8 inches), overall width that’s broadened to 70.9 inches (increased by 0.6 inches) and the same overall height of 63.4 inches, adds a more aggressive edge to the all-new Soul’s appearance. Likewise, the wraparound greenhouse, high-mounted tail lights and tall ride height are all hallmark design elements. 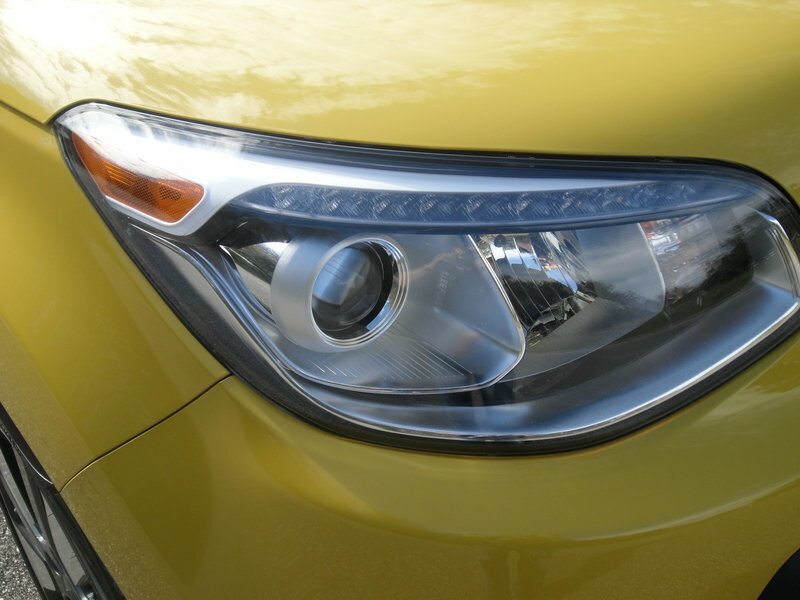 Premium touches such as available LED front positioning lights and rear LED “halo” lights help connect Soul to siblings within the Kia lineup that share similar design cues, such as the 2014 Sorento CUV and 2014 Forte sedan1. Exterior Track’ster similarities are easy to spot. The large trapezoidal lower air intake is nearly a direct carryover of the concept, and the location of the available fog lights – down low and pushed to the leading edges – mirror those found on the Track’ster. 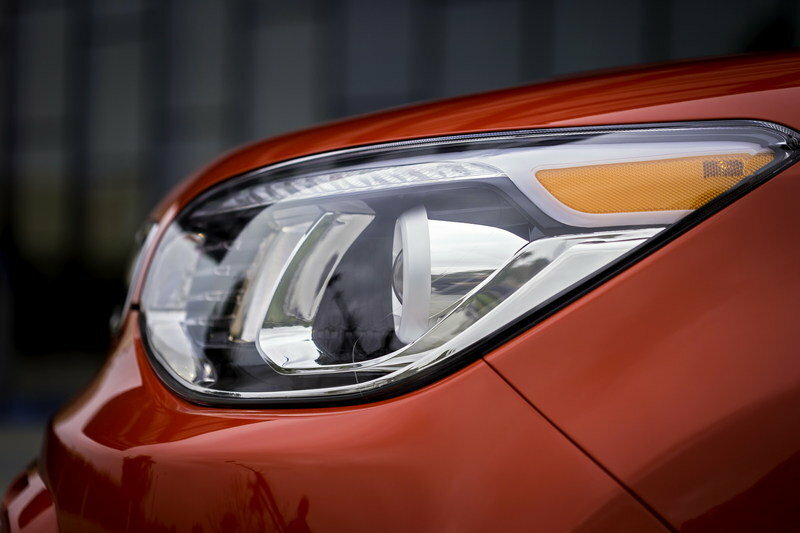 Kia’s signature grille is present, but it’s been reworked to more closely resemble the concept. Adding a touch of flare, the unique “floating” body color panel inset into the lift gate has its roots based in the Track’ster as well. Subtle enhancements include a wider (by 2.4 inches over the previous Soul) opening for the lift gate, allowing Soul to swallow more stuff. 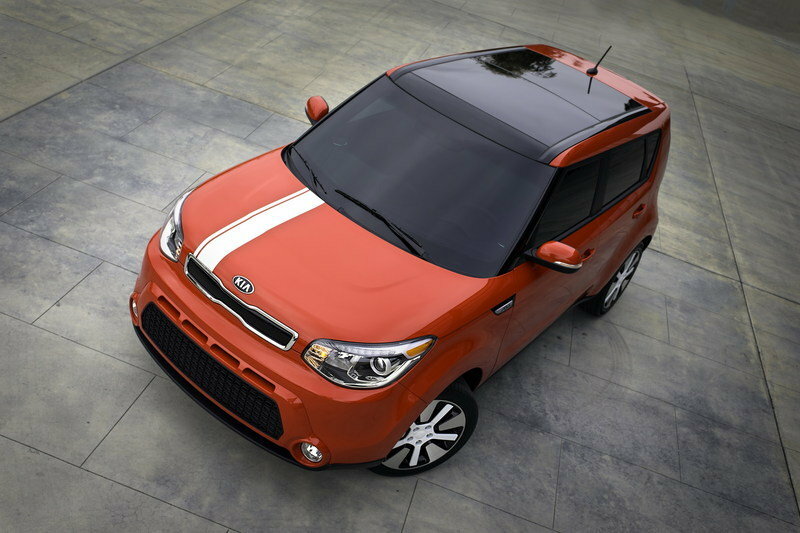 While final color names have yet to be determined, the 2014 Soul will be available in seven new exterior hues, including the two seen on stage in New York: Solar Yellow and Inferno Red. Front and center is the triple-circle instrument cluster with deeply recessed gauges. Along the door panels, sculpted circles incorporate the power windows and door locks. 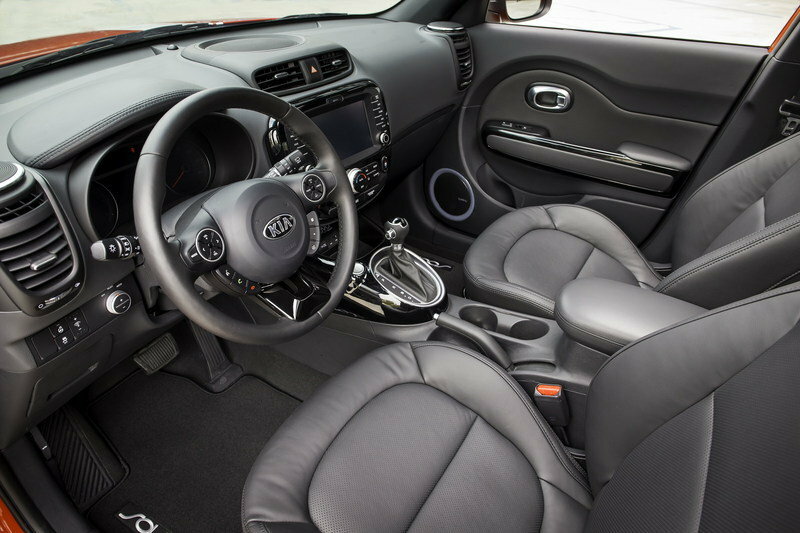 The center console features a round gear shift knob and push-button start – its location exclusive to Soul in the Kia lineup – which also are direct carryovers from Track’ster. The front door-mounted speakers mirror the circular, high-mounted “floating” tweeters and utilize available LED-string light technology to create ripple-effect red-hued mood lighting. 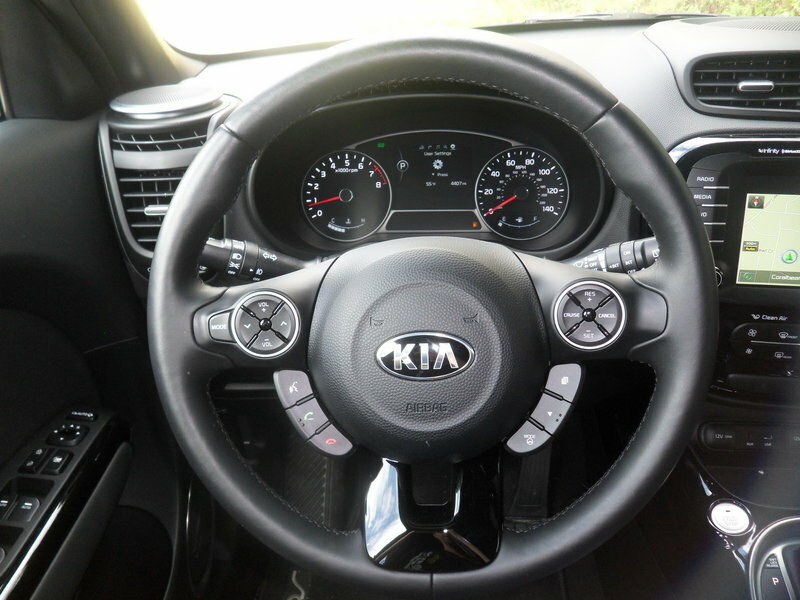 The steering-wheel mounted controls are housed in Soul-exclusive circular groupings along the lower spokes with the buttons for the audio system and trip computer falling readily to the thumbs, enabling the driver’s hands to remain on the wheel at all times. An attractive package is a let-down if the contents don’t deliver. Fortunately, the all-new Soul is set to delight right out of the gate. Most prominent in the new instrument panel is the available eight-inch touch screen – the largest ever offered on Soul – which houses Kia’s second-generation telematics and infotainment system, UVO eServices2, combined with Kia’s first use of the Android-based operating platform. Launching with Soul, UVO eServices is now compatible with the iPhone and Android Smartphone. UVO eServices is optional and takes in-car connectivity and media interplay to the next level, integrating a number of other Kia firsts. Topping that list is the high-definition capacitive touch screen. Its wide viewing angle affords better visibility and allows the user to scroll with the stroke of a finger. Living side-by-side for the first time in a Kia vehicle, the audio/video and optional navigation controls are viewable on the home screen. Combining the most accessed ancillary controls on a single screen helps reduce driver distraction and improves overall functionality and ease-of-use. Additionally, the available larger Supervision Cluster/TFT LCD color screen found in the instrument binnacle now displays turn-by-turn directions from the navigation system, helping to keep the driver’s eyes looking forward. Another first is the integration of Pandora3 internet radio, the revolutionary online radio network that allows the user to customize their listening experience. Users will no longer manage Pandora through their Smartphone. Instead, Pandora is preloaded into the headunit and accessible through the touch screen and Voice Command, displaying the artist, title and album cover art as well as allowing the user to conveniently skip songs, “like” the song with Pandora’s thumbs-up rating system, or manage preferred stations. Arriving with a three month complimentary subscription to SiriusXM™4 Data Services and Travel Link, the all-new Soul has access to travel information such as road conditions, weather and security alerts as well as sports scores, movie times, stock prices and fuel prices through the screen’s graphical interface and electronic program guide. Better still, customers will continue to have All Access to both Sirius and XM channels for the price of one should they elect to continue a paid subscription after the three month trial period concludes. Making all of this available technology easy to use is the industry-first integration of on-screen quick guide videos. Easily accessed through the touch screen, users have the ability to view instructional videos that highlight all of the features and functionality of UVO eServices along with the Smartphone app5 and MyUVO.com, including MyPOIs, powered by Google Maps. Combined, UVO eServices represents one of the most powerful and comprehensive infotainment systems on the market today. Making UVO eServices even more impressive is that there is no cost to the owner. Technology aside, driver and passengers will enjoy a larger and significantly quieter cabin with incremental increases in front leg room (42.9 inches, 0.8 inches more than the current Soul), rear leg room (up 0.2 inches to 39.1), front headroom (increased 0.2 inches to 39.6) and front seat shoulder room (up 0.3 inches to 55.5). The all-new Soul also offers a 0.5-inch lower hip point and a step-in height that’s reduced 0.2 inches, allowing for even easier ingress and egress. Overall cargo capacity is increased by a half cubic foot, to 24.2. Liberal use of expansion foam (replacing the previously used block foam) thoroughly fills body cavities, reducing outside wind and road noise. A reinforced isolation pad in the cargo area and poly-urethane-layered carpet helps reduce overall interior noise levels by approximately 3 decibels. The Base Soul comes standard with a long list of features that set it apart from the competition. Power windows, door locks and (heated) outside mirrors, a telescoping steering wheel and a six-speaker AM/FM/MP3 audio unit are all standard. Bluetooth®6 hands-free wireless technology, SiriusXM™ satellite radio with three months complimentary service and USB/AUX inputs round out the Base Soul’s impressive audio/infotainment equipment. 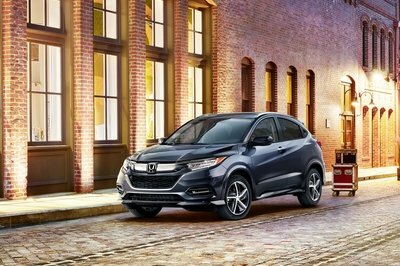 Desirable options include remote keyless entry, 16-inch alloy wheels, cruise control and a six-speed automatic transmission. The Soul Plus takes a step up in standard and available optional amenities. Attractive 17-inch alloy wheels shod with 215/55R-17 tires, outside mirror turn-signal indicators, auto-on/off head lights and unique fender garnish distinguish the Plus from the Base exterior. Inside, the Plus benefits include a floor console stowage box with integrated arm rest, UVO eServices, Rear Camera Display7 and rear seat center arm rest. Options include navigation, an upgraded Infinity®8 audio system, string-LED front speaker surround mood lighting, fog lights, a panoramic sunroof – a Soul first – leather seating with segment-exclusive ventilated front driver and passenger seats, and seat heaters for all four outboard positions, a 10-way power adjustable driver’s seat, leather wrapped and heated steering wheel and a leather-wrapped gear shift knob. The Soul Exclaim adds to the Plus as standard features 18-inch alloy wheels wrapped in 235/45R-18 tires, fog lights, body-color bumper “tusks,” projector head lights, front LED positioning lights and rear LED “halo” lights. Open the door and standard amenities include a high-gloss piano-black center console, cooled glove box, leather-wrapped steering wheel and gear shift knob, 10-way power driver’s seat with lumbar adjustment and auto-dimming rearview mirror. Optional equipment includes navigation, Infinity audio, front speaker LED mood lighting, panoramic sunroof, leather seating with front driver and passenger ventilation and heating for all four outboard positions. Supervision Cluster/TFT LCD screen, HID head lights, push button start and automatic climate control make the Exclaim the most premium Soul ever. Built on an all-new chassis that is nearly 29 percent stiffer than before, the Soul’s stout skeleton provides the base for a vehicle that places a premium on driving dynamics. Engineers put their efforts in strengthening the body at key connection points along the cowl, upper and lower B-pillars, cross members, and at the C-pillars. Fully, 66 percent of the chassis utilizes either Ultra High Strength Steel (35 percent) or High Strength Steel (31 percent). The A-pillar is 0.8-inches narrower, allowing for improved outward visibility, but through the use of Ultra High Strength Steel, it’s lighter and stronger. The application of structural adhesive around the door openings and along the roof also helps improve torsional rigidity. Significant attention has been focused on improving the all-new Soul’s ride and handling through heavily revised front and rear suspension set ups. The front subframe utilizes four bushings (none are used on the current Soul) to reduce ride harshness and impact booms over rough pavement. The stabilizer bar has been moved rearward on the McPherson strut front suspension, while the steering box has been moved forward, lending better balance and subsequently improved handling. Relocating the steering box has also yielded benefits to on-center feel. The new one-piece steering gear housing is stronger than the two-piece unit used on the current Soul, improving steering response and reducing impacts felt through the wheel. Optional is a new Flex Steer™ system, which allows the driver to select from three distinct steering settings: Comfort, Normal and Sport. The shock absorbers on the torsion bar rear suspension have been turned vertically (they were positioned at an angle on the current Soul) and lengthened. This arrangement allows for more suspension travel, improving ride comfort. 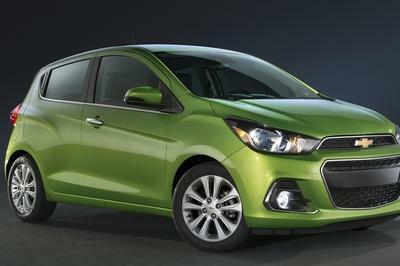 Motivation for the Base Soul is delivered by a gasoline direct injection (GDI) 130-horsepower (at 6,300 rpm) 1.6-liter all-aluminum DOHC four-cylinder engine. The GAMMA engine produces 118 lb.-ft. of torque at 4,850 rpm. The Plus and Exclaim models enjoy the more powerful 2.0-liter NU power plant. For the all-new 2014 Soul, the engine is updated with GDI technology. Power is rated at 164 horsepower at 6,200 rpm and 151 lb.-ft. of torque at a 4,000 rpm. Both engines have been tuned to provide more low-end torque (nine percent more torque at 1,500 rpm on the 2.0-liter; five percent more on 1.6-liter) for an improved around-town driving experience. The 1.6-liter engine is mated to a six-speed manual transmission or, optionally, to a six-speed automatic. The Plus model may be equipped with either transmission while the Exclaim is available exclusively with the six-speed automatic.